I love my cat. She's always doing something new and different. Or at least sleeping in a different place. Which is close enough, right? 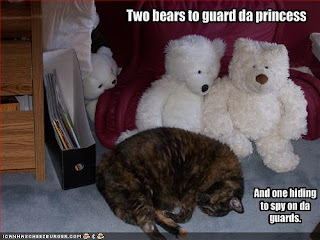 The first two bears were the reason I took the picture - just thought she looked so cute with them. When I brought the picture into the computer, I spotted the third sneaky-looking bear.